OBJECTIVE To assess the extent and content of newspaper and magazine coverage of research on passive smoking. DESIGN Content analysis of newspaper and magazine articles. SUBJECTS Articles reporting on passive smoking research published in newspapers (n = 180) or magazines (n = 92) between January 1981 and December 1994. MAIN OUTCOME MEASURES Numbers of articles, conclusions of articles, sources quoted, numbers and characteristics of research studies cited, presence of tobacco advertising. RESULTS The number of newspaper and magazine articles reporting on passive smoking research increased from four in 1981 to 57 in 1992 and 32 in 1994. Sixty-two per cent (168/272) of articles concluded that the research on passive smoking is controversial. Tobacco industry representatives were quoted significantly more often in newspaper articles (52%, 94/180) than magazine articles (12%, 11/92) (p<0.0001). Of 121 different research studies cited in the lay press articles, only 15 were from tobacco-industry sponsored projects or publications. In magazines, acceptance of tobacco industry advertising was associated with the conclusion that research on passive smoking is controversial (p<0.0001). CONCLUSIONS Although research on the harmful effects of passive smoking accumulated between 1981 and 1994, lay press coverage of the research maintained that the science was controversial. Few research studies were cited to support the industry's claim that passive smoking is not harmful to health. However, tobacco industry representatives who were critical of the research methods used to study the health effects of passive smoking were frequently quoted. Thus, between 1981 and the early 1990s, the scientific community reached a consensus that passive smoking is associated with adverse health effects. The purpose of this paper was to assess the extent and content of newspaper and magazine coverage of passive smoking research. We determined whether the research on passive smoking was portrayed as controversial and, if so, whether the portrayal of controversy decreased over time. We collected data on several journalistic devices that can be used to generate the idea of controversy.14 15 For example, we recorded the topic of research covered because the association of passive smoking and adverse health outcomes could be more controversial for some diseases than others. We recorded who was quoted in the articles because journalists could generate controversy through their selection of sources. We report the frequency, source, type, and conclusions of the scientific studies cited because journalists could generate controversy by selectively citing certain types of studies. We conducted a descriptive, cross-sectional content analysis of newspaper and magazine articles reporting on passive smoking research between January 1981 and December 1994. We included newspaper and magazine articles published between January 1981 and December 1994 that reported on research on the health effects of passive smoking. We defined research as any basic science, epidemiological, clinical, or review study, including government reports. Articles that discussed litigation or workplace smoking regulation without discussing passive smoking research were excluded. We began the search in 1981 because the first major studies showing an association between passive smoke and lung cancer was published in that year.6 7 We excluded duplicate articles, opinion pieces, editorials, and letters to the editor. Using an adaptation of a previously published method,16 we retrieved articles by searching three commercial online services (Nexis, Datatimes, and Knowledge Index—a Dialog database) using 12 keyword phrases for the term “passive smoking”. We limited our newspaper sample to the five papers with the highest average daily circulation rates in the United States (New York Times,Washington Post, USA Today, Wall Street Journal, andLos Angeles Times) because our preliminary search found that these newspapers published most of the articles describing research on passive smoking and that their articles were likely to be reprinted in other newspapers. We chose circulation rate as an inclusion criterion because it is an objective measure of the number of people potentially exposed to a news article. Our search identified 1474 full text articles which were independently screened by two reviewers to determine which articles met our inclusion criteria. Disagreements regarding included articles (n = 8) were adjudicated by the principal investigator. A total of 180 newpaper articles met our inclusion criteria for the content analysis. Five electronic databases (Dialog, EBSCO, Melvyl Mags, Nexis, and ABI/Inform) were searched using 12 keywords for “passive smoking” for articles from general and specialised magazines for lay audiences. We identified 233 full text articles which were independently screened by two reviewers to determine which articles met our inclusion criteria. The full text of nine articles could not be located in any of the electronic databases or at the San Francisco Public Library. Disagreements regarding included articles (n = 6) were adjudicated by the principal investigator. A total of 92 magazine articles met our inclusion criteria for the content analysis. A coding instrument for the content analysis was developed, pre-tested, and tested for percent agreement between the raters.23 24 All 180 newspaper articles and 92 magazine articles were coded independently by a research associate and doctoral student. The student did not have extensive knowledge of the literature on passive smoking, disclosed no financial conflict of interest, and was blinded to the study hypotheses. A written protocol was used and a training session was conducted. Interrater agreement was determined for all articles analysed and ranged from 93% to 100% for each question in the instrument. Discrepancies were adjudicated by the principal investigator. To assess the extent and prominence of coverage of research on passive smoking, we recorded the number of articles published each year, the length of each article, and, for newspapers, the section in which each article was published. For magazines, we coded the readership according to Urlich's International Periodicals Directory.25 We recorded the author(s) of each article and any affiliation(s) listed. The coders answered “yes” or “no” to the questions: (a) “Overall, is the reader left with the impression that passive smoking is a health hazard?” and (b) “Overall, is the reader left with the impression that there is continuing controversy about passive smoking research?” regardless of whether or not they felt that passive smoking was a health hazard. To determine if there was any change in the degree of controversy over time, we examined the answer to the question about controversy by year. To examine how an impression of controversy might be generated in the articles, we recorded the topic of research covered because the association of passive smoking and adverse health outcomes could be more controversial for some diseases than others. We recorded who was quoted in the articles because journalists could generate controversy through their selection of sources. We report the frequency, source, type, and conclusions of the scientific studies cited because journalists could generate controversy by selectively citing certain types of studies. We coded articles as discussing one or more of the following topics: (a) lung cancer, (b) other cancers, (c) heart disease, (d) health effects in children, (e) respiratory conditions, or (f) other. For each article, we recorded the number of quotes made about passive smoking research by (a) public health or government officials, (b) scientists, physicians, or academicians, (c) non-smoker's rights advocates, (d) tobacco industry representatives, (e) smoker's rights advocates, or (f) other or no affiliation given. To determine which scientific studies and reports were cited in the newspaper and magazine articles, we recorded the study name and author, if available, for each scientific study cited. We searched Medline by author name or keywords to identify the source articles for each cited study. A total of 90 scientific studies were cited in the newspaper sample and 87 studies were cited in the magazine sample. To assess the characteristics of the scientific studies cited in the newspaper articles, we obtained copies of 88 of the 90 scientific studies identified in the sample from the University of California Libraries, the Government Printing Office, or directly from the study authors. We were not able to obtain copies of an unpublished study funded by the Tobacco Institute and an international report. We obtained copies of 77 of the 87 scientific studies cited in the magazine sample. We were not able to locate 10 citations with vague and incomplete identifying information. 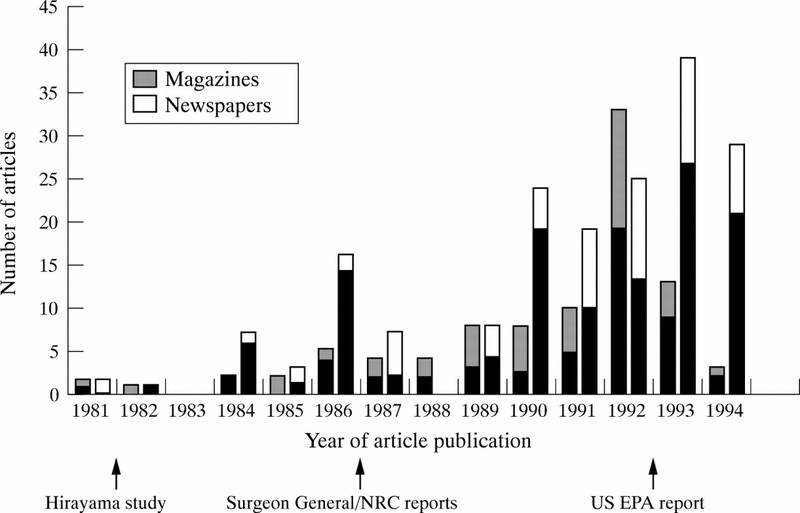 Overall, 121 different scientific studies were cited in the newspapers and magazines. For each scientific study obtained, we coded publication type as a (a) journal, (b) symposium proceeding, (c) government sponsored report, or (d) other, to provide a rough indicator of publication quality.18 26 Citations from journals were further coded using previously developed criteria27 by (a) type of article (original, review, letter to the editor, editorial, or abstract), (b) whether or not the article was peer reviewed, and (c) source of funding acknowledged in the publication. To determine whether the newspaper and magazine articles were more likely to cite studies indicating that passive smoking is harmful to health than not harmful to health, we recorded the context in which each article discussed the cited scientific studies. A cited study was coded as (a) concluding that passive smoking is harmful, (b) concluding that passive smoking is not harmful, or (c) “mixed” if it was reported as having harmful and not harmful findings or inconclusive findings. We examined the relationship between tobacco industry advertising and conclusions of the articles. To determine whether the newspapers in our sample accepted tobacco industry advertising, we first contacted the editorial office of each newspaper by mail and telephone. We received no responses and, therefore, searched the entire paper by hand for tobacco product advertising on a randomly selected day in 1981, 1985, 1991, and 1994. If no tobacco product advertisements were identified, the search was continued for the following six days. If any tobacco product advertising was identified the newspaper was classified as accepting tobacco advertising. To determine whether the magazines in our sample accepted tobacco advertising, we first determined whether the magazine was on a published list of magazines that refuse tobacco product advertising.28 If the magazine was not on the list, we posted a question on the Magazine Publishers of America website (www.mediafinder.com) asking whether the magazine accepted tobacco advertising. For 10 magazines for which we could not obtain information from either of these sources, we searched the entire magazine by hand for tobacco product advertising on a randomly selected day in 1981, 1985, 1991, and 1994. If no tobacco product advertisements were identified, the next two issues of the magazine were searched. If any tobacco product advertising was identified the magazine was classified as accepting tobacco advertising. Differences in proportions were analysed using thez statistic, χ2 statistic, Mann-Whitney Rank Sum test, or Fisher's Exact test as appropriate. As shown in the figure, the number of newspaper and magazine articles reporting on passive smoking research increased between 1981 and 1994. About half (88/180) of the newspaper articles were 500 words or more; 42% (39/92) of the magazine articles were 1000 words or more. The black part of each bar represents the number of articles that conclude that research on passive smoking is controversial. The arrows indicate the publication dates of four major reports on the adverse health effects of passive smoking. Hirayama = (7); Surgeon General report = (8), NRC report = (9), US EPA report = (13). Sixty-three per cent (114/180) of the newspaper articles were located in the national or local news section, 13% (24/180) were located in the health or science section, and 24% (43/180) were distributed across the business, feature, and other sections. Forty-two per cent (76/180) of the articles were on the front page of the section in which they were located. Most of the 92 magazine articles were published in general interest (n = 31), health/science (n = 21), or politics/policy (n = 12) magazines. The remainder were published in business, home, or consumer magazines. Sixty-six per cent (118/180) of the newspaper articles and 54% (50/92) of the magazine articles gave the impression that there is continuing controversy about passive smoking research (z statistic = 1.80; p = 0.07). However, 94% (170/180) of newspaper articles and 79% (73/92) of magazine articles gave the impression that passive smoking is a health hazard (z statistic = 3.53; p<0.0001). As shown in the figure, the proportion of articles leaving the impression that the research is controversial did not diminish over time as more research consensus reports on passive smoke accumulated. There were no significant differences between the types of health risks related to passive smoking covered in magazine and newspaper articles. More than half of the newspaper (63/92) and magazine (129/180) articles reported on studies of the association of passive smoking and lung cancer, followed by reports on health conditions in children in 46/92 newspaper and 86/180 magazine articles. The remaining articles reported on cardiovascular disease, cancers other than lung cancer, and other respiratory effects. As shown in table 1, public health and government officials were quoted most often in newspaper and magazine articles. Although the newspaper articles were shorter, tobacco industry representatives, public health/government officials, and scientists/physicians/academicians were quoted significantly more often in newspaper than magazine articles. The tobacco industry officials were consistently critical of research showing an association between passive smoking and disease. Overall, scientific studies were cited 348 times in the newspaper articles and 218 times in the magazine articles. Although magazine articles were longer, there was no difference between the numbers of scientific studies cited in magazine and newspaper articles (p = 0.07). About half of the newspaper (98/180) and magazine (49/92) articles cited only one passive smoking study per article. Only 32 of 180 newspaper articles and 28 of 92 magazine articles cited three or more scientific studies per article. In addition, most scientific studies were cited only a few times each in the entire sample. Only six studies were cited more than 10 times in the newspaper articles and only four studies were cited more than 10 times in the magazine sample. All of these most frequently cited studies were systematic reviews of the scientific literature, rather than original research studies. The single most frequently cited study was the EPA risk assessment of passive smoking13 which accounted for 14% of all study citations in newspapers and 17% of all study citations in magazines. In the newspaper articles, the EPA report was cited as concluding that passive smoke is harmful 45 times, and as an inconclusive study four times. In the magazine articles, the EPA report was cited as concluding that passive smoke is harmful 36 times, and as an inconclusive study twice. Most of the studies cited in the newspaper and magazine articles were cited as concluding that passive smoking is harmful. Eighty-eight per cent (305/348) of the citations in newspapers were cited as concluding that passive smoking is harmful, 7% (25/348) of the citations were cited as concluding that passive smoking is not harmful, and 5% (18/348) were cited as having “mixed” conclusions. Eighty-three per cent (181/218) of the citations in magazines were cited as concluding that passive smoke is harmful, 10% (21/218) of the citations were cited as concluding that passive smoke is not harmful, and 7% (16/218) were cited as having “mixed” conclusions. As shown in table 2, most of the studies cited in newspaper or magazine articles were from medical/scientific journals, followed by government sponsored reports. There were no differences in the types or peer review status of journal articles cited in newspapers and magazines (χ2 = 0.91; p = 1.00). Of the 110 journal articles cited in newspapers, 79% (87/110) were publications of original research, 13% (14/110) were review articles, 6% (7/110) were editorials, and 2% (2/110) were reports of conference proceedings. Ninety-nine per cent of the journal articles cited (109/110) were from peer reviewed journals. As shown in table 3, articles from magazines that accept tobacco advertising were less likely to conclude that passive smoking is a health hazard and more likely to conclude that the research on passive smoking is controversial than articles from magazines that refuse tobacco advertising. Table 3 also shows that there was no association between articles from newspapers that accept tobacco advertising and concluding that passive smoking is harmful or that research on passive smoking is controversial. Print media coverage of passive smoking research has increased over time and has been fairly prominent. Print news media articles can shape public opinion, influence policymakers, and influence the direction of scientific research,16 51-54 thus the increasing coverage of passive smoking research may have contributed to growing public interest in this issue. “TI is initiating a program of bringing foreign ETS [environmental tobacco smoke] scientists/experts to appropriate scientific conferences for presentation of papers, and while they are here, get them to speak to U.S. media on research facts, misrepresentation. Would include editorial board briefings as well as media interviews. We found only limited coverage of studies that did not find a statistical association between passive smoke exposure and adverse health effects. As more studies indicating that passive smoking is harmful (rather than indicating that it has no adverse effects) have been published in the medical literature,62 the lay press coverage accurately reflects the findings of research that is reported in scientific publications. The citation of studies finding an association between passive smoking and disease has been previously reported for coverage of passive smoking in Australian newspapers,63 as well as for coverage of other environmental risks.16 17 This reporting of the studies finding an association between passive smoking and disease is potentially undermined by the emphasis on the controversy surrounding research on passive smoking. In summary, although research on the harmful effects of passive smoking accumulated between 1981 and 1994, lay press coverage of the research maintained that the science was controversial. Few research studies were cited to support the industry's claim that passive smoking is not harmful to health. However, tobacco industry representatives who were critical of the research methods used to study the health effects of passive smoking were frequently quoted. This study was supported by the Robert Wood Johnson Foundation (Award 024783). We thank Jody Ranck for coding articles for the content analysis; Deborah E Barnes, Ruth E Malone, Anastasia Misakian, and Veronica Yank who offered valuable insight at various stages of this project, the Writing Seminar at the Institute for Health Policy Studies, and Phillip Lollar who provided administrative assistance. (1950) Tobacco smoking as a possible etiological factor in bronchiogenic carcinoma. JAMA 143:329–336. (1950) Smoking and carcinoma of the lung. BMJ 30:739. (1991) Health in the headlines: the stories behind the stories. (Oxford University Press, New York). (1996) The cigarette papers. (University of California Press, Berkeley, California). (1985) Cigarette advertising and media coverage of smoking and health. N Engl J Med 312:384–388. (1981) Non-smoking wives of heavy smokers have a higher risk of lung cancer: a study from Japan. BMJ (Clinical Research ed) 282:183–185. (1986) Environmental tobacco smoke: measuring exposures and assessing health effects. (National Academy Press, Washington, DC). (1992) Respiratory health effects of passive smoking: lung cancer and other disorders. (Office of Health and Environmental Assessment, Washington, DC) . (Publication No EPA/600/6-90/006F.). (1987) Selling science: how the press covers science and technology. (WH Freeman, New York). , ed (1989) Health risks and the press: perspectives on media coverage of risk assessment and health. (Media Institute, Washington, DC). (1991) Bias against negative studies in newspaper reports of medical research. JAMA 266:1824–1826. (1996) Media images, genetics and culture: potential impacts of reporting scientific findings on bioethics. (Brandeis University, Boston, Massachusetts). (1998) Why review articles on the health effects of passive smoking reach different conclusions. JAMA 279:1566–1570. (1991) Cigarette advertising policy and coverage of smoking and health in British women's magazines. Lancet 337:93–96. (1981) Analysis of coverage of tobacco hazards in women's magazines. J Public Health Policy Mar:29–35. (1980) Content analysis. in The Sage CommText series, vol 5. ed Kline FG (Sage, Beverly Hills, California). Weber RP. Basic content analysis. In: Lewis-Beck MS, ed.Quantitative applications in the social sciences, 2nd ed. Series 07-049). Newbury Park, New Jersey: Sage, 1990..
(1997) Ulrich's International Periodicals Directory. The Bowker International Serials Database, vol 4. (RR Bowker, New Providence, New Jersey). (1996) Industry-funded research and conflict of interest: an analysis of research sponsored by the tobacco industry through the Center for Indoor Air Research. J Health Polit Policy Law 21:515–542. (1994) More magazines forgo tobacco ads, some by choice, some by chance. JAMA 271:571–576. (1991) Passive smoking: how great a hazard? Consumers' Research, Jul:10–15..
(1992) Passive smoking and your heart. Consumers' Research, Apr:33–4..
(1993) When smoke gets in your eyes; passive smoking as a link to health problems for nonsmokers. Vibrant Life, Sep:12..
(1994) Just how bad is secondhand smoke? National Review, May 16:51..
(1987) Non-smokers: time to clear the air. Readers Digest, Apr:110–13..
(1993) Hazards of “secondary smoke”: effects of cigarettes on children. Good Housekeeping, Sep:174, 218–19..
(1993) Inhalation of sidestream cigarette smoke accelerates development of arteriosclerotic plaques. Circulation 88:1820–1825. (1994) Inhalation of steady-state sidestream smoke from one cigarette promotes development of arteriosclerotic plaque development. Circulation 90:1363–1367. (1994) Decreased fetal weights in rats exposed to sidestream cigarette smoke. Fundam Appl Toxicol 22:400–404. (1993) Effects of sidestream smoke exposure and age on pulmonary function and airway reactivity in developing rats. Pediatr Pulmonol 16:281–288. (1994) Exposure to sidestream cigarette smoke alters bronchiolar epithelial cell differentiation in the postnatal rat lung. Am J Respir Cell Mol Biol 11:312–320. (1994) The effects of alternative smoking policies on indoor air quality in 27 office buildings. Ann Occup Hyg 38:265–278. (1984) Effects of environmental tobacco smoke on urinary cotinine excretion in nonsmokers. Evidence for passive smoking. N Engl J Med 311:828–832. (1993) Subchronic inhalation study in rats using aged and diluted sidestream smoke from a reference cigarette. Inhalation Toxicology 5:77–95. (1986) Relationship of passive smoking to risk of lung cancer and other smoking-associated diseases. Br J Cancer 54:97–105. (1992) Cancer risk assessment: the science that is not. Regul Toxicol Pharmacol 16:10–20. , eds (1988) Indoor and ambient air quality. (Selper, London). , eds (1984) Medical perspectives on passive smoking. Prev Med 13:557. (1990) Environmental tobacco smoke. Proceedings of the International Symposium at McGill University, Montreal, Canada. (Lexington Books, Lexington, Massachusetts). (1986) Tobacco smoke and the non-smoker: scientific integrity at the crossroads. (Tobacco Institute, Washington, DC). (1986) Smoking and society: towards a more balanced assessment. (DC Heath, Massachusetts). (1987) Assessment of the association between passive smoking and lung cancer. (Yale University, New Haven, Connecticut). (1991) Setting the environmental agenda in Canada and the United States: the cases of dioxin and radon. Can J Polit Sci 24:3–27. (1993) Newspaper effects on policy preferences. Public Opinion Q 57:191–204. (1985) Science and the media: the boundaries of truth. Health Affairs 4:5–23. (1991) Importance of the lay press in the transmission of medical knowledge to the scientific community. N Eng J Med 325:1180–1183. (1995) Media wars. Lancet 346:1681–1683. (1995) Reporting research in medical journals and newspapers. BMJ 310:920–923. (1998) Health communication ethics (editorial). J Health Commun 3:291–294. (1993) Indoor air quality and environmental tobacco smoke—concentration and exposure. Environ Int 19:9–40. Anon. Issue strategy background. RJ Reynolds, 1989. Bates 50761 2180. , RJR page. Accessed 16 July 1998. www.tobaccoresolution.com. (1995) Newspaper reporting of the medical literature. J Gen Intern Med 10:19–24. (1997) How patients and policy makers can use systematic reviews for decision-making. Ann Int Med 127:37–42. (1989) The news on smoking: newspaper coverage of smoking and health in Australia, 1987–88. Am J Public Health 79:1419–1421.